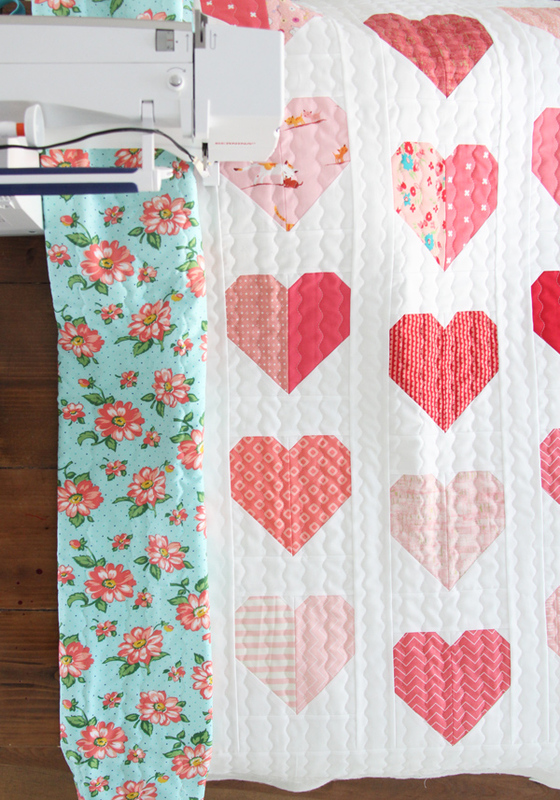 I’ve been meaning to update my first simple heart quilt tutorial for years, so this is just a fresh update! 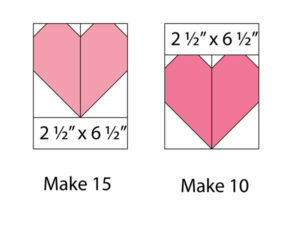 I also finally made a pretty printable pattern for Heart Blocks in multiple sizes you can find here. Cut 4 strips 1 1/4″ x width of the fabric. Sub-cut the strips each into 25 squares 1 1/4″, 100 total. Cut 5 strips 3 1/2″ x width of the fabric. Sub-cut the strips each into 10 squares 3 1/2″, 50 total. Cut 5 strips 2 1/2″ x width of the fabric. Sub-cut the strips each into 5 strips 2 1/2″ x 6 1/2″, 25 total. Cut 8 strips 2 1/2″ x width of the fabric. Trim 6 strips to 40 1/2″, and trim 2 strips to 42 1/2″ (if the strip 42 1/2″ wide, cut another strip and piece strips together). 1. Make 25 heart blocks using the 3 1/2″ x 6 1/2″ print strips, 3 1/2″ background squares, and 1 1/4″ background squares. 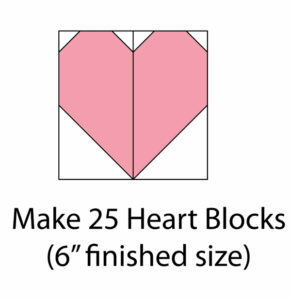 Follow the instructions found in my free Heart Block pattern printout for the 6″ blocks (click here or below), the blocks will be 6 1/2″ unfinished. 2. 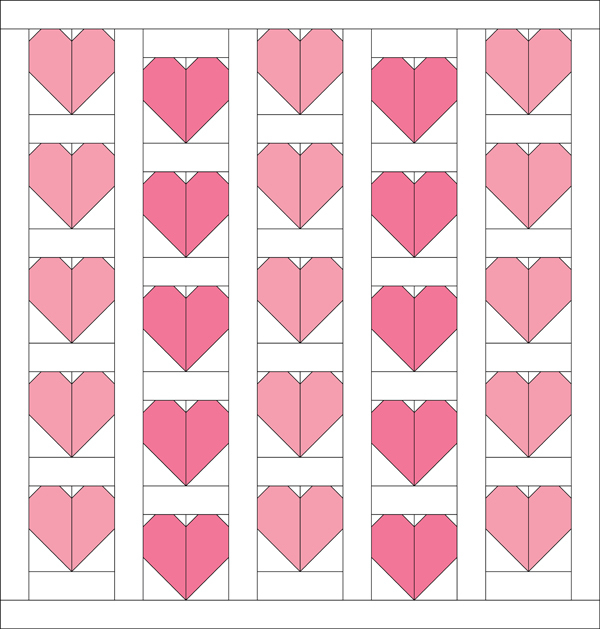 Sew a 2 1/2″ x 6 1/2″ background strip to the bottom of 15 of the heart blocks. 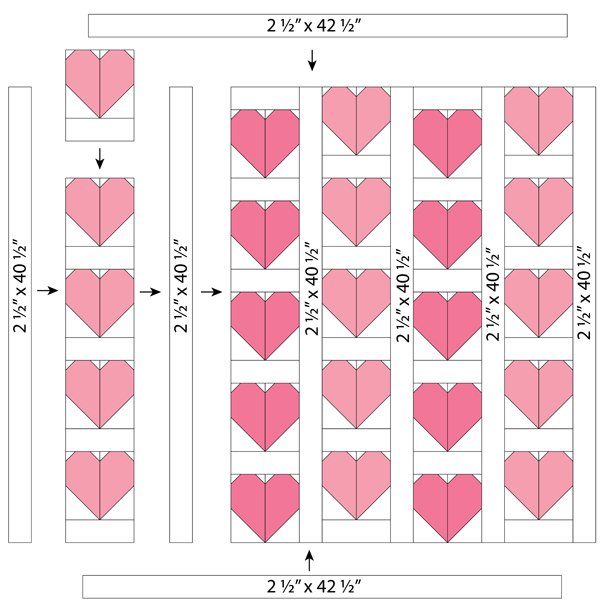 Sew a 2 1/2″ x 6 1/2″ to the top of the remaining 10 heart blocks. 3. Sew the heart blocks into 5 columns of 5 heart blocks each, alternating columns of blocks with the strip sewn to the bottom or the top. Press. 4. Pin and sew a 2 1/2″ x 40 1/2″ sashing strip in between each column and to the side of the first column and last column. Press. 5. Pin and sew the 2 1/2″ x 42 1/2″ strips to the top and bottom of the quilt, press. This is a super easy one to upsize. Just add more blocks to each column or more column, and increase the length of the sashing strips to match the length of the columns. You’ll need 3/8 yard of binding fabric, cut into 5 strips 2 1/2″ x the width of the fabric. And that’s it! I’ll never tire of seeing heart quilts! I finished this quilt with my walking foot in a wavy stitch. On my Bernina it’s stitch 4, with the stitch width set to 5 and the length set to 3. The backing is the aqua floral from my Dixie fabric line (from a few years ago). 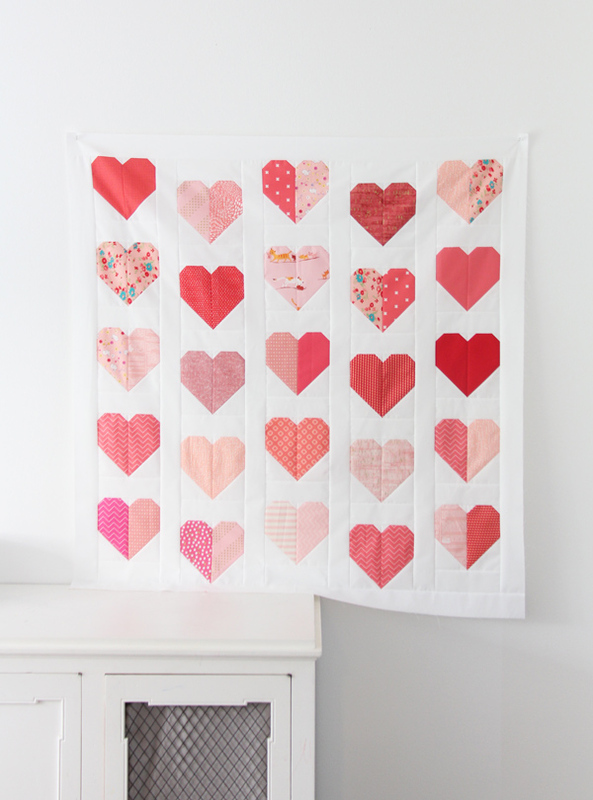 If you need another fun Heart project, I have a free pattern for this cute heart mini quilt you can find here. Leave any questions in the comments and I’ll try to answer them there! 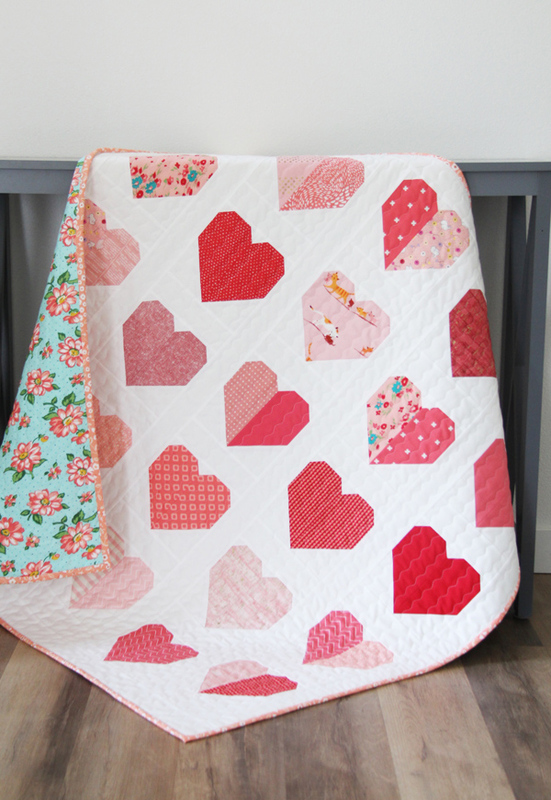 I never get tired of your heart quilts! They are so pretty and bold. Thanks for sharing them with us. Thanks so much for this pattern and the multiple size chart. I sew for charity (Sunshine Linus ) and I have used the original heart pattern to make a few quilts for them. Always a hit, thanks so much. Your directions are always easy to read and follow. Love your patterns. Thank you from the bottom of my (Valentine) heart! Lol!!! Thank you for the tutorial and just in time for the holiday. This is such a great pattern. I need tire of heart quilts either. So nice of you to make it free! Thank you, Allison!! I love everything you make. It’s in my “to do pile”. Allison, I am so happy with this pattern!!!!! I love all of your patterns and they are REALLY always fun and easy. I have made a couple of cutie baby quilts now, and this one is next up!! 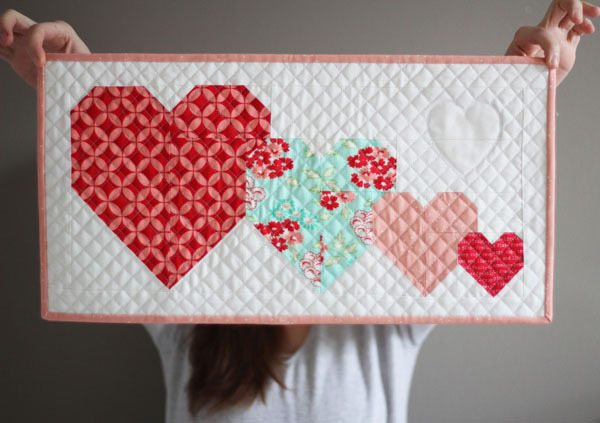 I’ve always loved hearts and red is one of my favorite colors, so this quilt is just the right kind of project for me to try! Your wavy quilting really adds to the over all look of the quilt. Thank you so much for sharing your pattern with us. Thanks for sharing! I can’t wait to get started! This is such a cute quilt! I am secretly working on a quilt for my pregnant friend and I had been planning on doing a chevron quilt in gray and teal but maybe hearts are even cuter for a newborn! Laurie, if you are quilting it yourself and your fabric is at least 44 or more inches wide, you can get away with 1 1/2 yards. But otherwise you need 3 yards. I was able to use 1 1/2 yards with my fabric and it was fine. Vielen Dank für dieses wunderbare Tutorial mit den vielen rosa Herzen. Ein Quilt auch zur Hochzeit. I really enjoyed making this quilt. Thank you. I am however trying to figure out what I did wrong as my rows didn’t line up as they should have and so I have an issue with sewing the bottom strip on. I will have to do something tricky to get it to work. I can’t imagine what happened but all in all I still love it! Hello Joy. You have probably fixed it already but, for anyone making this or any other quilt, watch your 1/4″ and just make it as accurate as possible. And when you have your blks made, some may need trimming to be the riight size, and saying this, you can also have some smaller than they should be – these blks have wiggle room sewn right on them with at white stip on the bottom or top of the blks, just trim the blks to be the same size. No, they do not have to be the pattern size – that is your goal, but sometimes they don’t turn out that way and who is going to know?? Also, If you have them all sew together, like it sounds like you do, the next ‘fix’ I would do to get a nice clean place to sew on my border is trim the sides (top/bottom/both sides) of the pieced blks till they are nicely square and even – just do not trim to much off any side!!! You want to have some fabric to get a good seam on it for that 1/4″!!! The beauty of this quilt, I love it!! Is it will be very forgiving of any ‘mistakes’ (creative sewing!! there are not mistakes!) and it will always look fantastic when it is done. And a baby?? Oh that little one is going to love it!!! My favorite backing for a baby quilt is flannel, sew a bunch of squares, strips, anything to make it big enough and just use that. Soft, cuddly and warm. Win/win!! Happy sewing! Thank you for the tips for her Brenda! The blocks are probably just a little wonky, which makes that bottom border a bit longer or shorter than normal. I would find the exact center of the quilt and the border strip (fold and gently crease both) and pin the centers, then put a pin at both ends of the quilt. Then pin the border strip to the quilt in between the end and center pins…and if you need to ease in extra quilt/border strip as you sew, or if you need to gently stretch the quilt/strip as you sew to make them fit you can. You just don’t want to pull too much or you’ll get a wavy border or quilt. Borders are tricky and blocks with diagonal seams like this can be wonky…but don’t get discouraged, it just comes with practice! I have a brand new grandniece. I have a lot and I really mean A LOT of pink print flannel! 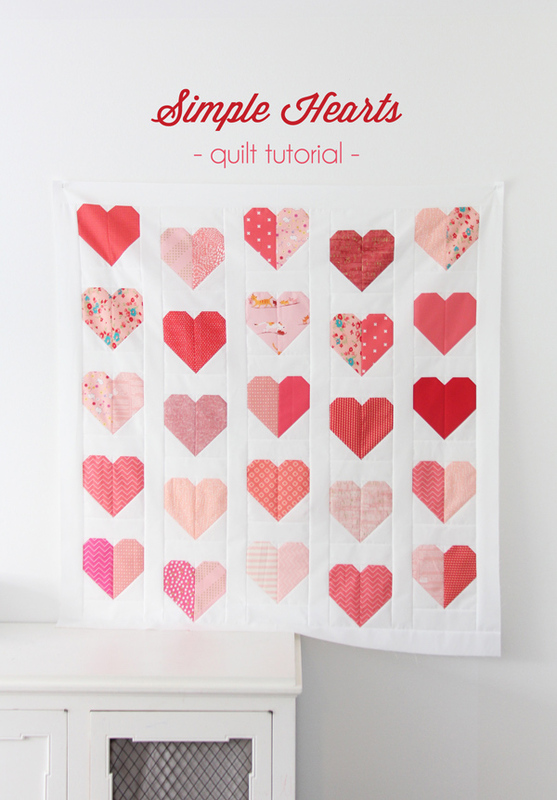 I’ve been looking for a simple heart quilt pattern and I think this is one of the best. I did download one from F & P that I had to pay for… it was “on point” but I think something was missing or I just don’t understand their directions… Anyway, I am so happy to have found this pattern. With this being said, I really like the effect of your original Simple Heart Quilt with the seams through the middle of the heart. Would like to know how to do that… I was wondering if it could be dont as a QAYG. I am very new to quilting. Hi! I’m glad you’ve found it helpful and yes any grand niece will love a cute heart quilt! The previous one with the seams running down the middle is the same, this version is just simplified and honestly much easier and less seams! This would be a hard one to QAYG, but I haven’t done enough of it to answer that for you. Thanks!